A young woman is found strangled in the stairwell of a college library, only her sneakers missing. With no physical evidence, no signs of sexual assault, and no witnesses, all the police have to go on are the three men who were in the library with her: her boyfriend and two campus security guards. . .all of whom have secrets, none of whom can be proven guilty. 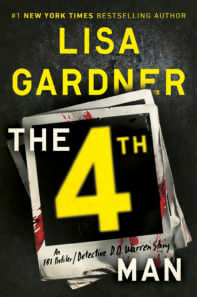 With Gardner’s singular ability to delve into the minds of criminals and law enforcement alike, The 4th Man is a shocking look at the reasons for taking a life. . .and just how far profilers need to go to learn them. "Lisa Gardner gives us the behavior behind the crime – she not only gives us a ‘who-dun-it’ book, but a ‘why-they-dun-it’ book. While this is a short story, there is a lot packed into it – and it's based on a real-life case!" "Another riveting quick tail of deceit, lies, and catching the bad guy."